Quello che mi rimane di te... (What's left of you...) ia another elegy dedicated to my mother. One discovers the real importance of a mother's presence when she is no more... This poem was inspired by the introductory lines which are takem from the poem of a well-known Italian poet, Ada Negri, who has also written an elegy for her mother. dai campi freschi di primavera. ma solo godere della sua amabile presenza. dopo lunghi lunghi mesi di esilio. ...A M O R E.
In the last months of 2007 I have published two new textbooks. The first is Temi fil-Poezija Maltija u lilhinn (De la Salle Brothers Publications): it is intended to help students studying Maltese poetry at Intermediate and Advanced levels. The book is divided in four sections which discuss four important themes in Maltese poetry: National Identity; the Spiritual Experience; Life Experiences; and the Natural Environment. The four themes are then divided in other sub-themes thus discussing aspects such as Toponomy, Historical Events, Christ, the contribution of religious poets, the sea and the vallies in poetry, the micro and the macrocosm. 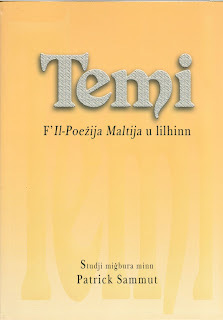 Temi f'Il-Poezija Maltija u lilhinn takes the form of 18 essays which discuss the abovementioned aspects and some others, always in relation to Maltese poetry of the 2oth century. ORA! is another textbook which offers the student preparing for his Intermediate and Advanced Italian exam a number of comprehensions, summaries, grammar exercises, essay titles, information regarding different aspects of the Italian culture such as cinema, literature, newspapers and journals, music and politics. It also includes cloze texts and exercises which help to better one's idiomatic skills in Italian. The book is divided in three sections: The Religious Experience; the Arts; and Social Problems. In this way students are helped to recognise different registers and increase their vocabulary. The different articles taken from presentday Italian newspapers and journals can also serve as a starting point for discussing different issues.